A dashboard is the welcoming screen of your app. It provides a starting point for the user. A dashboard can be static or dynamic, e.g. you can incorporate live wallpapers or changing content such as news items. On a category dashboard, entrance points to content are displayed in several categories. The categories are represented by an icon and a title, and lie full screen in a grid orientation. This lay-out allows the user to find content faster. 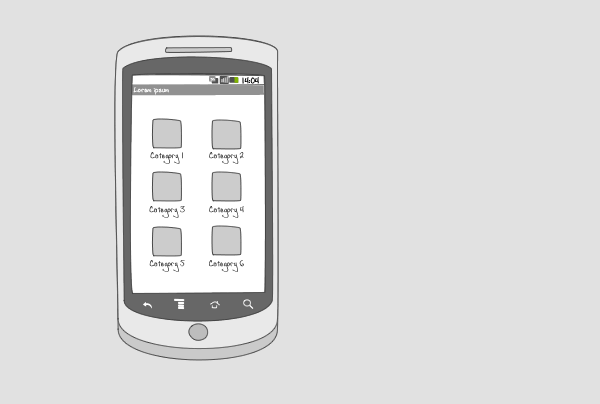 A category dashboard can be used when your app is content-focused and your content can be divided into categories. To improve searchability, a search bar can be incorporated into the dashboard. The dashboard can also be used together with an action bar. 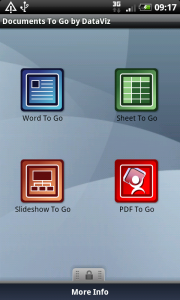 2 ... shows a list of pdf-documents that are available on the phone. 1 Google Places shows different categories of places to find in the neighborhood. 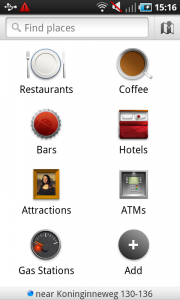 Custom categories can be added by the user. The dashboard includes a searchbar to facilitate finding places. 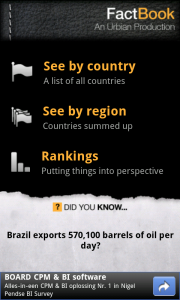 1 The reference app Factbook offers access to data and statistics of countries. On its dashboard you can search for data per category, that are displayed in a list of 3. The screen space that is left is used to show facts and a Google-add.